It doesn't take installing expensive solar panels or purchasing electric company vehicles to ensure that your small business is being energy efficient (although those things are certainty nice to have). 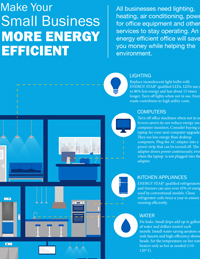 There are some simple steps that you can take to ensure your small business is being energy efficient. Replacing older inefficient incandescents with ENERGY STAR® certified LEDs can save you up to 80% on your lighting expenses and making sure that computers and other office equipment is turned off when not in use can also save on the kWh meter. To learn more about how you can save more for your small business download these handy guides below.